In mathematics, a hyperbolic angle is a geometric figure that defines a hyperbolic sector. The relationship of a hyperbolic angle to a hyperbola parallels the relationship of an "ordinary" angle to a circle. The magnitude of the hyperbolic angle is the area of the corresponding hyperbolic sector. 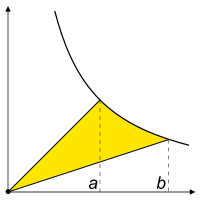 Hyperbolic angle is used as the independent variable for the hyperbolic functions sinh, cosh, and tanh, because these functions may be premised on hyperbolic analogies to the corresponding circular trigonometric functions by regarding a hyperbolic angle as defining a hyperbolic triangle. The parameter thus becomes one of the most useful in the calculus of real variables. is unbounded); this is related to the fact that the harmonic series is unbounded. , the hyperbolic angle should be negative. This reflects the fact that, as defined, the angle is directed. has a hyperbolic sector with an area half of the hyperbolic angle. Circular angles can be characterised geometrically by the property that if two chords P0P1 and P0P2 subtend angles L1 and L2 at the centre of a circle, their sum L1 + L2 is the angle subtended by a chord PQ, where PQ is required to be parallel to P1P2. The same construction can also be applied to the hyperbola. If P0 is taken to be the point (1, 1), P1 the point (x1, 1/x1), and P2 the point (x2, 1/x2), then the parallel condition requires that Q be the point (x1x2, 1/x11/x2). It thus makes sense to define the hyperbolic angle from P0 to an arbitrary point on the curve as a logarithmic function of the point's value of x. Whereas in Euclidean geometry moving steadily in an orthogonal direction to a ray from the origin traces out a circle, in a pseudo-Euclidean plane steadily moving orthogonally to a ray from the origin traces out a hyperbola. In Euclidean space, the multiple of a given angle traces equal distances around a circle while it traces exponential distances upon the hyperbolic line. (x, y) ↦ (rx, y / r), with r > 0 . [He made the] quadrature of a hyperbola to its asymptotes, and showed that as the area increased in arithmetic series the abscissas increased in geometric series. A. A. de Sarasa interpreted the quadrature as a logarithm and thus the geometrically defined natural logarithm (or "hyperbolic logarithm") is understood as the area under y = 1/x to the right of x = 1. As an example of a transcendental function, the logarithm is more familiar than its motivator, the hyperbolic angle. Nevertheless, the hyperbolic angle plays a role when the theorem of Saint-Vincent is advanced with squeeze mapping. Circular trigonometry was extended to the hyperbola by Augustus De Morgan in his textbook Trigonometry and Double Algebra. In 1878 W.K. Clifford used the hyperbolic angle to parametrize a unit hyperbola, describing it as "quasi-harmonic motion". In 1894 Alexander Macfarlane circulated his essay "The Imaginary of Algebra", which used hyperbolic angles to generate hyperbolic versors, in his book Papers on Space Analysis. The following year Bulletin of the American Mathematical Society published Mellen W. Haskell's outline of the hyperbolic functions. It seems worth mentioning that to unit rapidity corresponds a huge velocity, amounting to 3/4 of the velocity of light; more accurately we have v = (.7616)c for a = 1. [...] the rapidity a = 1, [...] consequently will represent the velocity .76 c which is a little above the velocity of light in water. Silberstein also uses Lobachevsky's concept of angle of parallelism Π(a) to obtain cos Π(a) = v/c. ). The infinite series for cosine is derived from cosh by turning it into an alternating series, and the series for sine comes from making sinh into an alternating series. 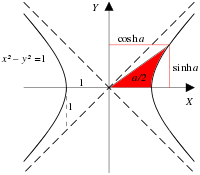 The above identities use the number i to remove the alternating factor (−1)n from terms of the series to restore the full halves of the exponential series. Nevertheless, in the theory of holomorphic functions, the hyperbolic sine and cosine functions are incorporated into the complex sine and cosine functions. ^ Augustus De Morgan (1849) Trigonometry and Double Algebra, Chapter VI: "On the connection of common and hyperbolic trigonometry"
Janet Heine Barnett (2004) "Enter, stage center: the early drama of the hyperbolic functions", available in (a) Mathematics Magazine 77(1):15–30 or (b) chapter 7 of Euler at 300, RE Bradley, LA D'Antonio, CE Sandifer editors, Mathematical Association of America ISBN 0-88385-565-8 . William Mueller, Exploring Precalculus, § The Number e, Hyperbolic Trigonometry. John Stillwell (1998) Numbers and Geometry exercise 9.5.3, p. 298, Springer-Verlag ISBN 0-387-98289-2.